Matthew ordered The Food Lab one day and as soon as it arrived we sat down to peak through it. We didn't just peak, we went in depth into each section and were immediately inspired by the cooking methods of eggs. We became fixated on the French or "fancy" style of cooking them and had to give it a go immediately. The French Omelette method is now officially my favorite way to cook eggs, and I will only ever order it this way in a restaurant (if it's an option)! Intrigued yet? Let me walk you through how to make one below. How To Make The Perfect Omelette: French Style! I read through a couple different ways of making this, and although all are almost exactly they same, they all seem to emphasize a different point which is the most crucial. But, when I was making mine I found that cooking it on low heat and being patient as it transforms into soft eggs was most crucial to getting it just right! You want a smooth, evenly colored outer skin, or elephant skin as some may call it, and a soft, slightly undercooked, incredibly buttery center. And, that to me is perfect! 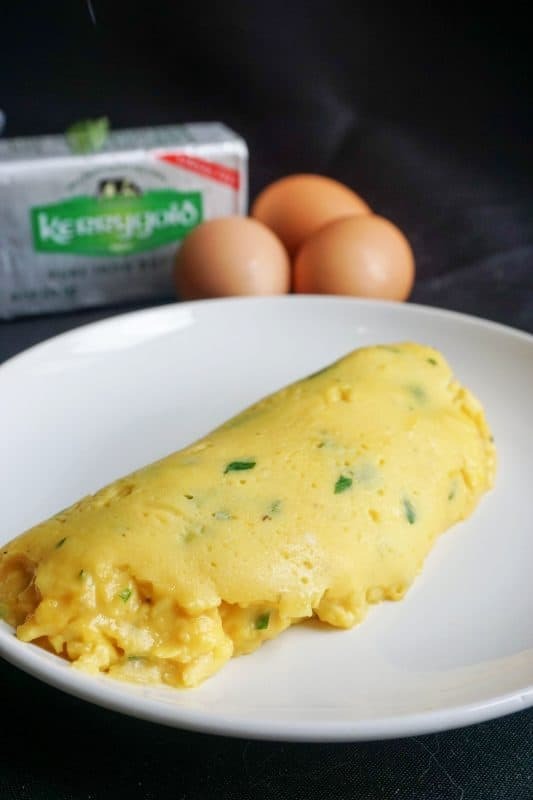 The ingredients needed for a french omelette are quite simple: eggs, butter, milk or heavy cream, salt and pepper, and some herbs. Although we chose to go a more simpler route you can even go completely plain and leave out the herbs, add cheese prior to rolling it up or cut a slit down the middle after it has been plated and fill it with some delicious meats. 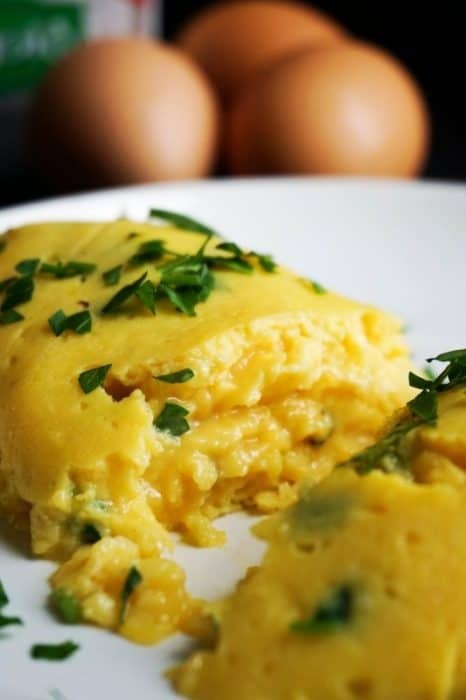 Although the french omelette recipe is simple, the method takes some practice! We are an egg loving household to say the least. We always have at least 18 hard boiled eggs in the fridge at any given moment and a dozen or two raw just for cooking and baking. I'm also an egg salad fanatic making it multiple times a week, and matt could eat breakfast for every meal of the day, which he often does. So you could have guessed this isn't our only egg recipe. You can also make our Bacon Egg Cups and Lo﻿﻿w Carb Breakfast Bowl if you are looking for a range of breakfast eggs! But, I must note that this French omelette is by far the best way to cook and enjoy eggs any time of day. 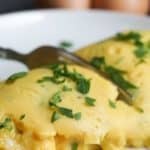 Recipe can be quickly added to MyFitnessPal - Search "KetoConnect - French Omelette"
Combine eggs, yolk, heavy whipping cream, salt, pepper and parsley into a bowl and mix until frothy. Let the egg mixture sit for 15 minutes. Drop 1 tbsp of chilled, cubed butter into the egg mixture. Set aside. Add 1/2 tbsp butter to a 7 or 8 inch non-stick skillet and turn on to low heat. Once butter is fully coating the skillet pour in the egg mixture. Using a spatula continuously stir the egg mixture scrapping it off the bottom and the sides. Patience is key! Once the eggs have firmed enough to remain in place when scraped through with the spatula, spread it over the entire surface of the skillet and remove from heat. Cover with a lid and allow to sit for 1-2 minutes. Starting from one end, use the spatula to slowly roll the eggs into an omelette. Once rolled into an omelette, push out onto a plate and enjoy!